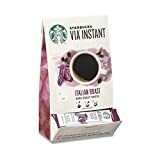 Starbucks Via Ready Brew is Starbucks version of instant coffee, however, Via isn't freeze dried coffee, but very finely ground coffee beans. According to Starbucks customer service Via's caffeine content can range from 130mg to 140mg per packet. Via comes in 7 different unsweetened varieties including the Iced Via. They also have three flavored Via options which have added cane sugar. Iced Via contains 2 servings per sachet for a total of 260-280 mg of caffeine. Starbucks Via Ready Brew contains 16.88 mgs of caffeine per fluid ounce (57.06mg/100 ml).